Friday the 3rd July had been a hot and humid day across SE England and with an elevated mixed later being advected North West from France with dewpoints in the mid 60's the stage was set for Differential Thermal Advection to kick of Storms just inland from the south coast. MUCape of the order of 1,200jkg was very good for our little Island. The first storms kicked off in the SE Around 2245z and about 15 miles North of Brighton. I went to a new location tonight to grab these prolific lightning producing storms and everything looked great. The only major fly in the ointment was a rookie mistake leaving my camera remote release cable and battery on my kitchen table. So I had to bomb it back the 20 minutes to my house and by that time a pretty severe elevated storm was on my doorstep so all I had left was the trusty garden view and hope to pull off a few strikes. In the end did not do too badly and the shot below is shot at F13 At ISO 100 At 15 second exposure. Our last chase day did not contain any weather so we awoke in Pierre and set sail for Sterling on a relaxing but boring drive through the lovely Sandhills of Nebraska. There was much chatter amongst my friends about a CME Explosion reaching the heady heights of KP8 And the Auroral Corona slipping quite a way south. Sterling would not only have a lot of height at 4,085ft above sea level but would also have clear skies and also it sits at the top NE Corner of Colorado with nothing much in the way of population to its north. The major problem though is it's latitude at only 42 Degrees North. It is however closer to true magnetic north which is situated in Canada. We arrived in Sterling around 6pm and went out for our last chase tour meal getting back to the hotel at around 945pm as darkness was falling. One of the other guests (Ian) who had seen the Aurora before in Sweden noticed a fog like appearance on the horizon and started smiling - This would be the signal to head out to darkness a few miles east of Sterling as some of his pictures even from the town were showing glowing green on the horizon. Was this really going to happen now ? Having never seen the Northern Lights before and missing 2 opportunities over the last 5 years chasing in the Northern Plains was I to break my duck now ? Below : Picture showing the Northern Lights North of Sterling (Colorado) at 42 Degrees North. When we got to our location we could see visually a very faint green glow dancing away just above the horizon. As time went past something resembling a hail shaft appeared above the green and it was only when we did some 15 second exposures that the Purples and Blues and Reds started to show up. This was truly an amazing experience as we also had the Milky Way rising behind us in the Eastern Sky. Colorado had not only given us some amazing tornadoes and supercells this year but was giving us a send off to remember, this is the sole reason I love this place so much. Below : Pictures From Green all the way through to the Burst of Colours. And to finish it off an incredible image shot by the talented Ian Carruthers of the Aurora and Milky Way in a 12 shot stitch. SPC Today went with a very small 10% Tornado risk area in NW South Dakota and surrounding that a large 5% box covered most of Eastern North Dakota and most of Central and Eastern Montana. Supercells were expected to initially be discrete before a huge bow echo or line segment would once again turn into a derechio with 80knt 500mb winds and 5,000jkg of MUCape on tap later on. We got to Faith and had some lunch and then pressed on towards Bowman. A nice Supercell was already in progress South East of Glasgow (MT) and this was travelling towards us at about 35mph. I took us South from Bowman towards Ludlow and sat on the ND/SD Border and watched as this storm rolled in. It was Classic in appearance and had a very well defined Hail shaft in the forward flank. A few motorists in expensive cars rolled upto us and asked if they could head north into Bowman to which I replied "Not if you value that lovely Red Mustang" It always amazes me people can not see hail falling in front of them. The rotation as the wall cloud and rain free base went over our heads was really picking up. The storm by now was about 5 miles to our east so we had to blast south to Ludlow and take some dirt roads (Highway 858) east for about 10 miles to get to our next paved road (Highway 79) near Ralph. Once we got to paved we were once again just SE of the storm and with it really ramping up should have stopped there for 5-10 minutes but knowing it was diving south east at quite some pace I decided to do the extra 12 miles south and then get on our old friend Highway 20 to go east towards Bison, This would utimately be a mistake as once we were halfway down that route a big white cone tornado dropped pretty much where we sat about 10 minutes before. Aaargh the joys and luck of storm chasing! Below : Structure near Ralph just before a large white cone tornado dropped. About 10 minutes after that picture was taken above we stopped abruptly as the big white cone tornado was clearly visible in our rear view mirrors. This was starting to turn into quite an amazing day with our Supercell still totally discrete and seemingly getting even stronger. Roads at this point were now not going to be kind to us and seeing as we were now North West of the core and hook area if we wanted to see more tornadoes from this cyclic supercell we would have to get into the bears cage and flirt very closely to any tornadoes that might be rain wrapped. As we went east from Bison we punched through golfball hail and on approaching the junction near Meadow and Coal Springs we saw tornado number 4 at close range whilst getting pounded with hail. This was a bowl shaped multi vortex tornado, again we have lots f videos of this tornado and some guests have pictures which they will forward onto me. After seeing the Multi Vortex we pushed on along Highway 20 towards Glad Valley where we encountered hail upto baseball sized which put some serious dents in the cars, once again we punched through the bears cage and this time witnessed tornado number 5 for the day SE Of Glad Valley which was a tall pencil cone tornado on the ground for about 3 minutes. We got to Isobel and gassed up and made room arrangements for the night and plumped for Pierre, and we had 1 last look at this amazing Supercell that had been ongoing for nearly 8 hours now and travelled 275 miles in the process. After all of that and getting to Pierre around 1230am we thought that was it for the day. But...........off to the west of us we had the little matter of a Derechio heading towards us at 75mph from the Rapid City area with embedded tornado warnings thrown in for good measure. We calculated we had about 45 minutes before this would slam into us at Pierre. Some weather stations were recording 95mph straight line wind gusts with this so we knew something major was on its way. When it hit us at 230am in the morning we had 2 very distinct strong wall clouds go pretty much over the hotel so it was no surprise to hear the tornado sirens blaring as it hit us, we measured 150km per hour winds in Pierre and the damage was extensive. And just before that little event hit us I managed to pull off probably my best lightning picture of the trip just to round things off. We have extensive video of the derechio which I will post up soon. This was a great end to the season and with another 26 Tornadoes for the season I was looking forward to a well earned steak tomorrow evening. 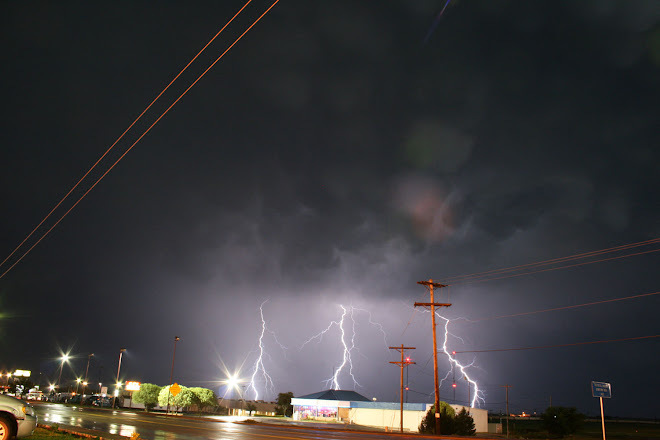 Awoke today bleary eyed in Spearfish (SD) After our early morning Devils Tower lightning shoot. SPC Had an enhanced risk for a possible derechio later in the day but before all that Montana had another chance to redeem itself for yesterdays epic bust. We headed into SE Montana and sat around 30 miles east of Broadus watching a developing discrete Supercell. I stayed where I was for 2 reasons, the first was the views east of Broadus looking west which were superb and easily 50-60 miles and the 2nd great Internet coverage. Our storm was moving east south east at about 40mph so it would not be long before the storm would come to us. Our first look at closer range was of a stunning Classic Supercell with attendant tornado warning on it. The structure was very nice and we got onto Highway 202 which was perfect as it went ESE Towards Belle Fourche. We continued on Highway 202 and kept stopping every 5 miles to look back at the ever increasing HP Nature of the Storm, at one stopping point we put ourselves right in the hook of the Supercell as it went tornado warned again. A much bigger problem was the sporadic softball sized hail falling around us although we never thankfully took a hit to the cars at this point such was the random nature of the stones falling. Below : In the Hook and GRLevel 3 Radar Grabs showing our position. We continued onwards again and followed the storm to just outside of Belle Fourche. Highway 202 in this area cuts through Montana, Wyoming and South Dakota in the space of 10 miles so this became a tri state supercell in a matter of 15 minutes. The Cg Lightning was increasing and a much stronger wall cloud with decent rotation and tighter reflectivity was beginning to start at this point. If my camera was good enough the structure at this point was mind blowing and the Cg's raining down at about 20 per minute, my camera could not do this storm justice but managed to get a cg shot every 1-2 second exposure at F22 & ISO 100 On 2-3 second intervals. At Belle Fourche I had a decision to make to wether drive south towards Spearfish or to carry on east on Highway 202 as we know had 2 Supercells and both were once again Tornado Warned. I went straight across at the junction allowing the initial supercell more time partly also because the amount of times this season I have driven away from a storm and it has produced 10 minutes later I could count on 2 hands. The velocities at this time were much better also and in fact so strong I really thought they were reading wrong as whatever was buried in the rain had to be substantial for such a strong couplet with 125kts of gate to gate shear. About 10 miles East of Belle Fourche we stopped to be about 2 miles south of the strong hook echo and could not believe it when a very large 1 mile wide tornado cleared enough of the rain to afford us a view just before darkness. Finally a Tornado for Tour 4! All in all one of my favourite chases of the 2015 Season along with some great pictures and also recognition from NWS Rapid City when we sent them our Tornado Picture and they verified it with local EF2 Damage in the Hereford area. Started today in Sterling and had a firm target of the Rapid City area. Storms today should easily initiate in an upslope flow regime near the Black Hills region. We got upto SW South Dakota in good time and watched towers start to explode to our North West near the Keystone and Mount Rushmore area. We headed North to be about 15 miles south of Rapid City and then followed and chased a beautiful little LP Supercell for the next few hours towards the Indian Reservations. Once again with such a high cloud base there was little chance of a Tornado today but what was on offer was some stunning High Based Supercell Structure. After chasing we ended the night in Sundance (Wy) and watched the line of storms roll in from SE Montana which also put us in a decent position for a chase in SE Montana the following day. After yesterdays Amarillo to Sterling travel day we had a decent handle on today and had high hopes for the first tornadoes of Tour 4. My chase target was Chugwater to Torrington and so we set off north towards Scottsbluff and then west towards Cheyenne on I80. A decent looking storm to the west of Torrington started to take on that oh so familiar LP Shape and also started to move quite quickly to the South East. It briefly went tornado warned and we found a great vantage point to the South of Torrington to watch and get some pictures. After the above pictures were taken we headed south towards La Grange and kept this storm always within 20 miles keeping in front of it. Another Supercell had fired pretty much on top of us and we positioned to be just south east of Supercell number 1 above and just south west of Supercell number 2 which was now South of Scottsbluff. After letting that storm go we went back to see how our original Supercell was doing and thought it might look pretty Shelfie seeing as we were hearing of 4" Hail reports coming in from South East of Torrington and we were not wrong with the structure with a stunning HP Supercell trundling towards us. We got some snaps and called it a day heading back to our starting point of Sterling again. Overall another dissapointing day tornado wise with very little or weak rotation noted in all storms we saw. There was another risk further east today along a strangely shaped north to south warm front, a couple of weak landspout spin ups were reported with these storms but as of going to print there still seems to be no pictures of these events so pretty happy with our structure from today. We started today in Lubbock and SPC Had a broad Slight Risk area and 5% Tornado risk across most of the Texas Panhandle and Eastern New Mexico. Once again I liked an area NW of Lubbock towards Clovis and we got a quick lunch and ate at a park and as we were doing so big towers were building 30 miles to our North West. We headed off and it wasnt long before we were looking at a developing Supercell. This time it was discrete and not only that was pretty much stationery. It was hard at times to work out the storms motion thinking it was going SE But in reality it did not move for a good few hours, it rapidly turned into a HP Storm which as it was sitting over a flat brown field the green sky made for some great pictures. After a few hours of watching this storm and it started to move off the boundary and move away to the North East it started to go outflow dominant and merge with other storms to the north, we dropped further south and west and picked up a stunning Classic Supercell moving out of New Mexico, we drove right under the base of this and down the eastern edge. Again some of the Cg lightning with this was spectacular but like Supercell number one after a few funnel clouds and weak rotation it also started to go outflow dominant and HP in nature. We now had a really nice South East road and watched as a stunning shelf cloud set-up. Dirt and dust from the field was also being lofted into the storm now which made for more stunning pictures and video. But ultimately it was game over for today and we retreated to Plainview for dinner at Chillis before heading north to Amarillo as this would be the last of the Southern Plains chases for us this season and we now needed to head north for the next week of chasing.